I’ve never been a big sports fan. I’ve never been a star player. I don’t like watching sports on TV. I’m not the person to talk to about sports. Period. Having a son has forced me to make some changes. For one, whether I like it or not—and I don’t—my son includes me in one-sided conversations about plays, players, stats, the spelling of their names. “Who is Rodney Brown?” I ask. I don’t recall this kid from his class, but that’s nice that my son remembers. My son demonstrates the play-by-play of a game, then rewinds in case I missed the best part. “No, but did you see this?” he says as he swoops in with the ball, leaps through the air, and rolls on the floor for the touchdown. “It was something like that.” I don’t even know what to say. Ever. Just mm-hmm or wow when it could be a wrestling move for all I know. 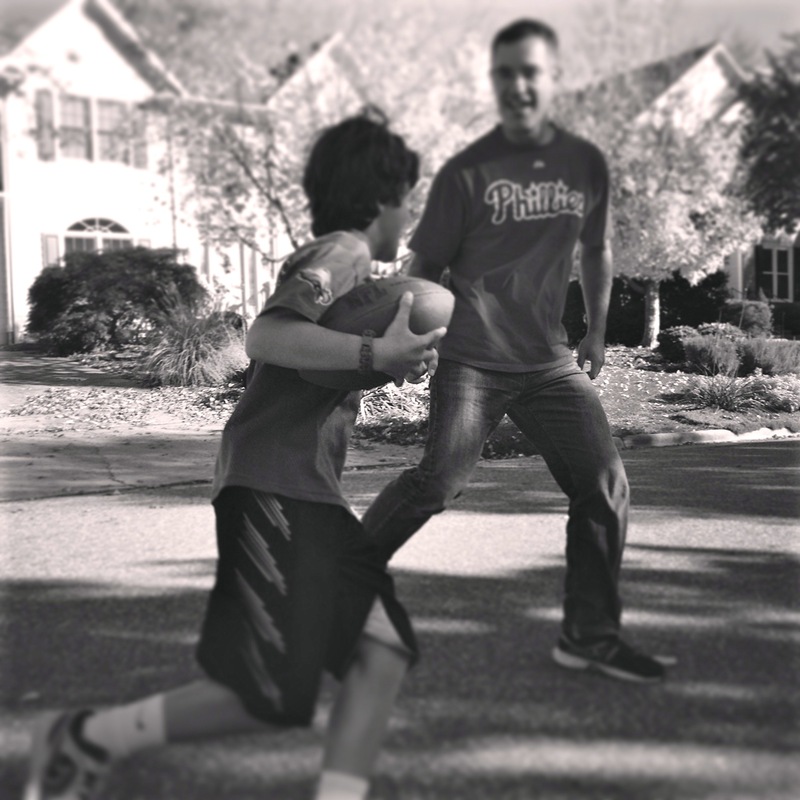 I never thought I would spend cold afternoons on our street throwing touchdown passes and yelling “Hike” as my son rushes toward the end zone. I can’t throw very far so I have to run behind him as he runs so I can make my pass. I’m working on my spiral though. I’m impressed I even know what one is. We shopped for football gloves the other day. Gloves? I didn’t even know they made those for football. “What are those?” my son asked, pointing to the white plastic bicycle seat-looking contraptions hanging below the gloves. “Those are cups,” I said, hoping the conversation would quickly shoot back to the gloves or a player or anything but those cups. “For protection,” I said, trying to play it cool as I examined the rubbery gloves a lot longer than I should have. Please don’t ask if you drink out of them. “Ooooh!” His eyes lit up. He pointed between his legs. “Now I see why they’re all so big down there.” Forget the gloves. We quickly moved over to toys. These conversations never happen to my husband in a public place. I’m not sure what part of our conversations suggests that I am a football maniac, but one thing is certain: My son is definitely in love.